The downloaded pictures are of a man who works for the US Forest Service in Alaska and his trophy bear. The US Forest Service, backtracking from where the bear had originated, found the hiker's 38-caliber pistol emptied. Not far from the pistol was the remains of the hiker. The other body has not been found. Although the hiker fired six shots and managed to hit the grizzly with four shots (the Service ultimately found four 38 caliber slugs along with twelve 7mm slugs inside the bear's dead body), it only wounded the bear and probably angered it immensely. This email tale, circulating constantly in one form or another since November 2001, seems to grow taller year by year. Ironically, the first two snapshots — the ones showing a hunter posing beside the carcass of an incredibly large Alaskan brown bear — are authentic. We know where and when they were taken, and by whom. The origin of the third photo purporting to show the remains of the behemoth's final victim is unknown. It was appended to the already-circulating email in late 2002. 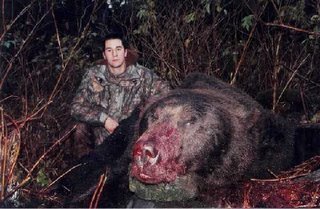 In real life, the big grizzly in the first two photographs measured 10' 6" from nose to tail and weighed an estimated 1,000 to 1,200 pounds — unusually large for the vicinity in which it was found, says the USDA Forest Service, but not quite a world record, nor even a record for Alaska. It was killed on October 14, 2001 by U.S. Air Force Airman Theodore Winnen on Hinchinbrook Island, Prince William Sound. The photos were taken by his hunting partner, Staff Sgt. James Urban. Both were stationed at Eielson Air Force Base near Fairbanks at the time. 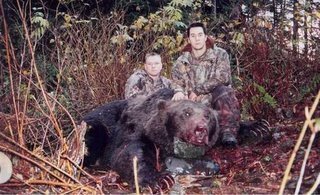 Though the bear was within 10 yards of the hunters' position and moving towards them when he fired the first shot, Winnen says, it did not charge them, contrary to what the email claims. "I don't know if the wind was in our favor or what," he told the Anchorage Daily News. "We were dressed in camouflage. He might not have seen us." Winnen's weapon was a 338-caliber Winchester Magnum, not a 7mm semi-automatic as alleged. The first bullet pierced the bear's brain but left it standing; five more in the chest brought it down. Was the bear a man-eater, as claimed in the email? No, says the Forest Service, there is no evidence of that. When asked by the Anchorage Daily News to comment on the horrific final image of what appears to be a partially-eaten human victim, Forest Service spokesman Ray Massey admitted he hadn't even looked at it. "I didn't want to see a photo of the body," he said. "I know it's bogus." Notice how much smaller the bear's head seems. In the photo at the top, the head is simply in the forground closer to the camera, which makes it look so big. I would guess that is probably what inspired someone to exagerate the story. Snopes also gives a detailed account by the hunters. I'm not making the URL a hyperlink, because it also has a photo of a naked dead body that has been severly chewed by animals, and I didn't want to link to it directly. It's not related to the story but was included in some emails. The analysis above called the photo "bogus", but that's only in relation to the bear story, it IS a real body chewed on by animals. It's really grusome, so if you go there and chuck up your cookies, well, you were warned! That's one big bear! My brother has done bear hunting and gotten his. It scares me to think of him doing it. Bears are scary, but grizzlys have to be the scariest. I've never seen one this big! I'm going to link to this. You do realize that this story is a FAKE don't you. That is a large bear and I did look at What Rando said. Even by the standards at that link its still a big bear. Personally I don't care who killed it. My hubby being the evil capitalist that he is worked in a mancamp in Alaska on the pipeline years ago. He said they had a 24/7 bear watch for all bears. Polar bears were pretty scary they too killed and ate humans. Oops, I had a feeling I ought to check the authenticity first, guess I should've but I was in a hurry this morning. I've just added an update, thanks. jgf: Thanks for the link, I will reciprocate. Patty: thanks for the "Tag", I shall answer in the next day or so. 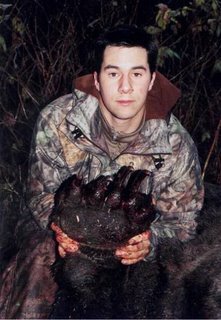 The bear is killed charging someone armed with a 7mm semi-auto rifle and we're expected to believe the report that this bear is NOT a 'man-killer'? 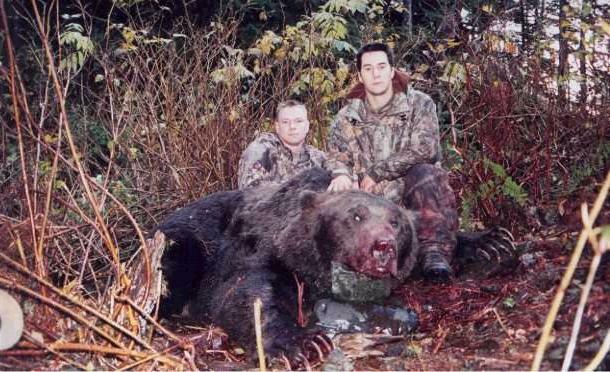 Or are we to believe that the bear just up and died and this guy plugged it with his rifle to make a name for himself.